Being able to properly “capture the light” when taking a photograph has been (is) one of my hardest things to learn. I always seem to be at the wrong place at the right time (like sunset for example, when I’m usually facing directly west). 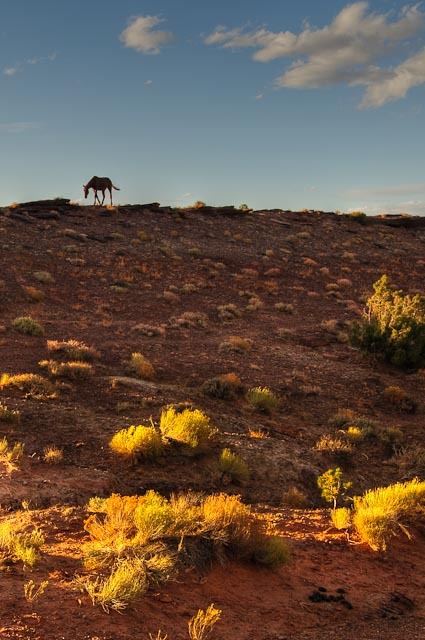 For example, I saw this wild horse roaming along a ridge-line in Northern Arizona last Fall, with the sun setting, and immediately started to shoot. Unfortunately, I was essentially shooting into the sunlight, with lots of dark shadows in the foreground. But, I was so excited what with a unique subject like the wild horse at hand, I didn’t pay that much attention to “the light”. But, when I later got all my images from that day’s shooting onto my computer, I immediately saw the problem. However, I shoot mostly in RAW (versus jpeg) and that allows me some leeway in developing an image afterwards without loss of detail in the light and dark areas. So, even though my subject was severely back–lit, I was able to come up with what I think is a nice photo. I used Photomatix Pro to process the original as a single–image HDR to open up the dark foreground, and then made some minor adjustments afterwards in Lightroom 2.6 (such as toning down the bright bushes in the foreground, which were absorbing the strong light from the setting sun. Nikon D300, f9, 1/200 sec. ISO 200.